In this tutorial, we deconstruct Channel 42 by Wolfgang Gartner & Deadmau5 and show how the sounds in the song can be created with Viking and some built in Reason effects. Here’s what the result sounds like. The transcribed segment is about midway in the original track. This tutorial will not go through every setting but will give you the basics of how the sounds are created. Download the song file to follow along. The main sound is a polysynth with a lot of distortion playing chords. To make this sound we can use the PolyViking Combinator. The PolyViking has Oscillators 1 and 2 enabled in the same octave. The wave shape is set near sawtooth. 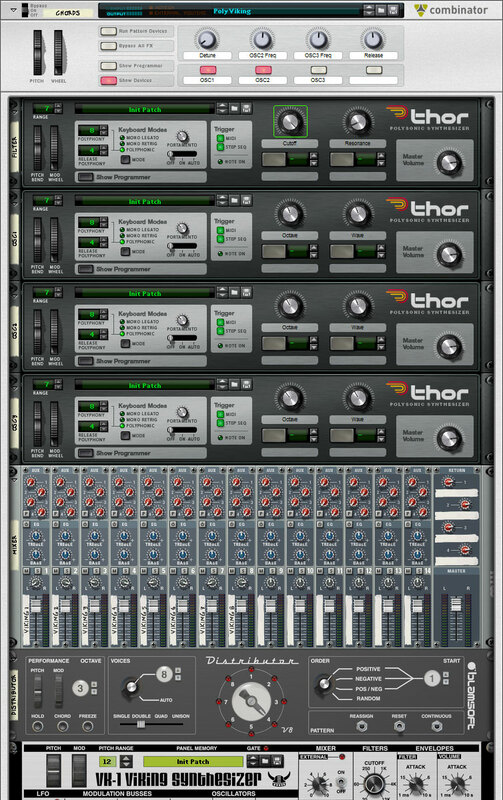 In order to get a wide stereo sound, the panning of the individual voices have been set to near hard left and right in an alternating pattern in the mixer. In the Distributor the voice slider is set to Double which results in a stereo pair of voices. A very important component of the Chords sound is the distortion. A Scream distortion set to the tape setting with high damage level gives a nice sound that is similar to the original. Another synth that plays throughout the entire passage is the bass synth. 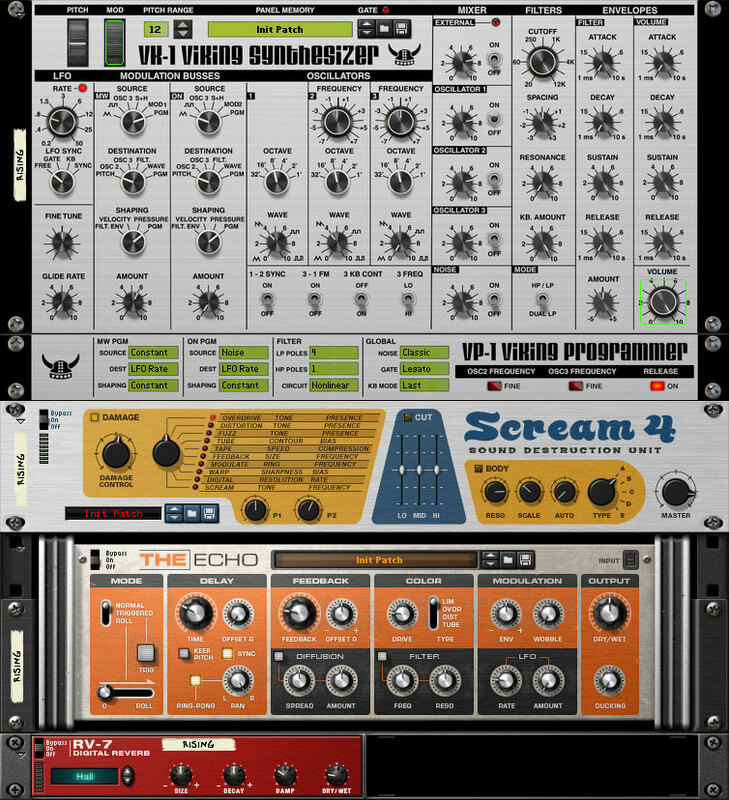 To get a thicker sound, this synth uses three oscillators with the wave shape set between triangle and sawtooth. One oscillator plays an octave above the other two. The filter cutoff is about half way on the knob. The notes are transposed down an octave to create a sub bass for the last repeat. The lead synth sound is three slightly detuned sawtooth oscillators. One oscillator is an octave below the others. The filter is bypassed resulting in a brighter sound. 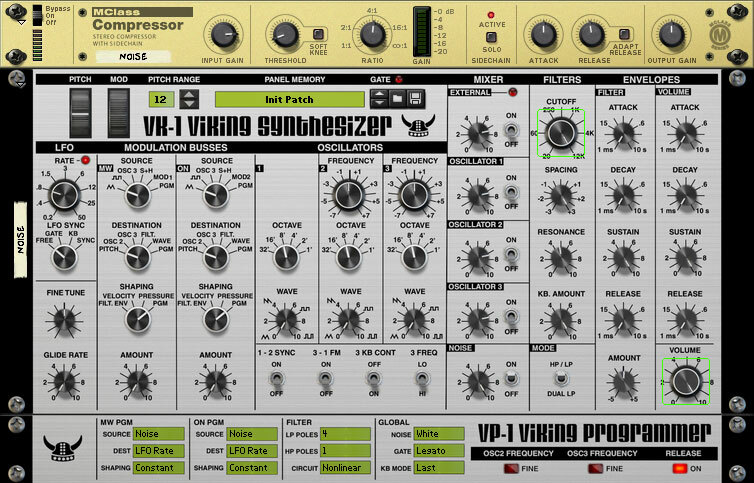 The lead synth has a great vibrato effect that is automated with the mod wheel. The 1/16 rate triangle LFO is routed to Pitch in the Mod Wheel bus. Just a small amount is needed. The Mod Wheel is automated to ramp from off to full during a note. 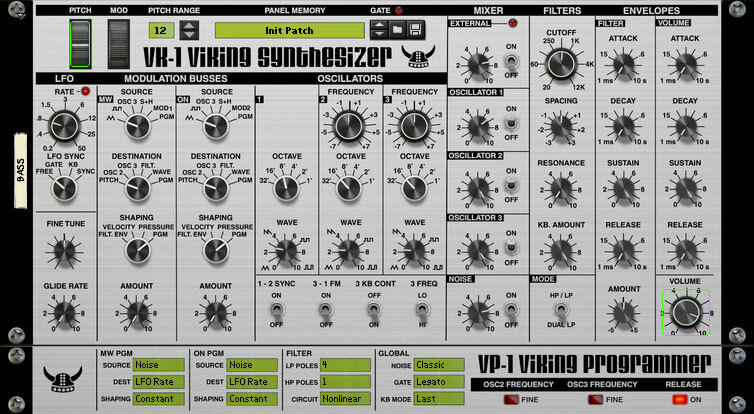 The noise effect is created with the Viking noise oscillator set to white noise. The filter is set to HP/LP and Spacing at +3 to create a narrow bandpass filter. The volume and filter cutoff are automated to create a build. Heavy sidechained compression completes the effect. The rising sound near the end builds the passage to the break. This synth is a single sawtooth oscillator with overdrive distorition. 1/16th note ping pong delay and lots of hall reverb complete the sound. The pitch rise is controlled with the Mod Wheel by routing Constant to Pitch in the Mod Wheel bus. There are only a few other final touches on the song, a bit of reverb on the chords and lead, and some eqing of the chords. The entire instrument mix is routed through sidechain compression. Now you’re familiar with the Channel 42 sound design. Check out the song file to get the detailed settings. And leave comments or questions below.